Think you have a great costume and want to show it off? The Masquerade gives you a chance to do it on stage in a really big way! Come show off your costumes to the rest of the world and to our panel of experienced cosplayer judges who will decide the winners and present awards based on the quality of their costumes and presentations. Don’t have a costume? Come anyway and cheer on the labor of dozens of cosplayers as they show off their hard work. Walk-ons do not perform skits but come out on stage to show their superb costumes like in a fashion show. These presentations allow fans to see the work of cosplayers who are great craftsmen but are less interested in writing and acting. Saturday, August 6, 2016, between 10:30am to 12:30pm or until the total maximum of 80 entries has been reached. The Registration Desk will be in room 513AB. Registration forms are available in an online printable format and at the Masquerade registration desk. Please note that we will only take completed registration forms at the registration desk (do not submit the registration form by e-mail). Also, note that printing the registration form in advance does not guarantee acceptance in the Masquerade. You must report to the Masquerade Green Room by 3:00 pm on Saturday, August 6 in room 230A. Please note that you will not be able to leave the Green Room after this time. It is therefore strongly recommended that you get something to eat beforehand. The Masquerade Awards Ceremony will take place on Sunday, August 7, 2016, starting from 12:30 pm during the WCS Event in Main Events room 210. The Masquerade Desk will be open from 4:00 pm until 5:30 pm on Sunday, August 7, 2016 after the ceremony. Sketch/Skit: A short scripted performance of maximum ONE (1) minute. May be performed alone or as part of a group, however larger groups will NOT be given more time. If the skit should run over the time limit, the entry will be disqualified, sound and lighting will be cut and the participant(s) will be escorted off the stage. Parade/Walk-On: A presentation of the costumer's workmanship. 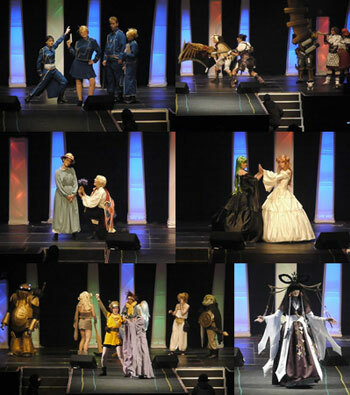 The participant walks onto the stage, poses at center stage showing various angles of their costume and character portrayal, and then exits the opposite side of stage. Background music is permitted and should be supplied by the contestant. There is a LIMIT of 80 entry slots TOTAL for the Masquerade. No EXCEPTIONS will be made, so register early! Use of open flame, fire, flash powder or flash paper is not allowed. No laser pointers allowed. Sealed electronic flashes are permitted. If you are using a strobe effect, please note it on your form so the MC may warn the audience. No messy substances on stage. If in doubt, ask the Masquerade Director. The stage must be in as good a condition when you leave as when you entered. If you are leaving something on stage, it must be easily retrievable by the stage crew, or you will be expected to bring your own ninja for that purpose. No real firearms, no realistic copies, and no projectile weapons are allowed. No metal blades are allowed, regardless if they are dull or live. If your costume requires a bow, it must be unstrung when you are not on stage. All weapons must follow the Convention's Weapons Policy. NO EXCEPTIONS WILL BE MADE. Each person may participate in only ONE entry during the Masquerade. Individuals may enter several costumes into competition, but they can only wear one of them and the others must be worn by other Masquerade contestants in the same entry. Contestants must report to the Masquerade Green Room on time. Report times will be supplied at the convention at the Masquerade Registration Desk. Failure to appear or to be ready to go on stage may result in disqualification. Note that Acts of God may, to an extent, mitigate this. The Masquerade Directors reserve the right to remove anyone from competition based on taste, danger to the audience or other contestants, or for any other reason deemed sufficient. This is an amateur competition. Professional costumers are ineligible for awards, but may still present their work during the show in the "Out-of-Competition" category. However, due to the limited number of entries and the popularity of the event, the Masquerade Direction may decide to pull back "Out-of-Competition" entries in favour of judged entries. Commissioned costumes are allowed only if (and only if) the designer of the costume has filled out and signed the registration sheet. While the designer does not have to walk on stage, his/her presence in the Green Room is obligatory. Costumes bought online will NOT be accepted. Wigs and small accessories/jewelery are exempt of this rule. A contestant who has won three awards or less in the Journeyman Division; or who wishes to enter this division, provided that they do not belong in a higher division in use in the competition. A contestant who has won three times or less in the Artisan Division, or has won a Master award at a nationally recognized regional anime convention. Also, anyone who is a professional in a costume-related business must compete as a Master. For the purpose of this competition, a professional is defined as making 50% or more of their income in the costuming-related business. The Masquerade is an amateur competition. Purchased or rented costumes may not be entered in competition for awards, but may be shown on stage in the Out-Of-Competition Division. Costumes made for business purposes, theatrical and professional events are not eligible for awards but may also be shown in this Division. In addition, anyone who wants to show their costume in this Division may do so. Note: Due to the popularity of the masquerade, entries will no longer be accepted in this division.